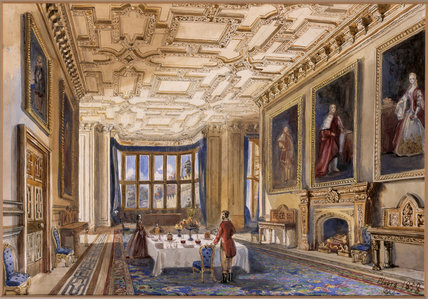 THE DINING ROOM AT FLOORS CASTLE, Duke of Roxburghe's, 1858, by Dulcibella Orpen at Baddesley Clinton. Shows square dining table laid with decanters, glasses, plates and fruit. Credit Line : Baddesley Clinton, The Ferrers Collection (acquired through the National Land Fund and transferred to The National Trust in 1980), ©NTPL/Angelo Hornak.